CoreRFID Solution Helps Meet FASET Standards. Specialised problems demand specialised solutions. Promoting safer working in one of the UK’s most dangerous trades, construction, is the specialism of G&M Safety Netting. In 2007/8 over half of the fatalities caused by falls from a height at work occurred in the construction industry and falling was responsible for almost 1000 serious injuries in construction. G&M Safety Netting provides fall arrest systems. The company delivers safety netting, airbags and work platform safety systems designed to make working environments safer. But a safety net or other fall arrest systems does not, on its own, guarantee safety. To ensure that, their systems are installed and used in line with industry best practice. To help meet those standards, G&M Safety Netting uses electronic tags in order to keep track of the usage of safety nets. The partner they chose to work with them in the project was CoreRFID Ltd. Following the original implementation in 2009, the system was recently updated. Safety netting installations form an essential part of construction site safety. 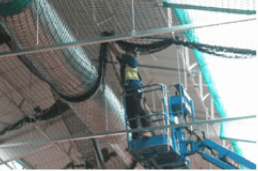 Based in Middlewich, Cheshire, G&M Safety Netting provides a range of safety netting installations at sites involving both new build and building refurbishment. In both environments workers are exposed to significant risk of falling. As part of the installation of G&M Safety Netting products, their staff have to ensure that the products provided deliver the highest possible safety standards. G&M Safety Netting installations are carried out by riggers trained and approved by the Fall Arrest Safety Equipment Training (FASET) association. Part of the FASET code of practice is to use safety nets rigged and handled in conformance with British Standard BSEN1263-2 which requires regular testing of safety nets. To help with this G&M Safety Netting has an inspection system that uses RFID tags attached to each net. The tags can be read electronically, providing data on usage. The G&M Safety Netting solution is based on CoreRFID’s CheckedOK application, a customisable package that is used for asset management and health and safety applications across construction, engineering and related sectors. CheckedOK allows information to be collected from tags using a hand held computer. The information can be transmitted in real time or at the end of the day over GPRS or wi-fi links to the CheckedOK server, updating records of the items tagged. Reports can be accessed via a web interface making it easy to implement the system. G&M Safety Netting use high frequency RFID tags that are attached with cable ties to the safety nets. Tags are robust and able to withstand exposure to weather. Identity codes on the tags let the system record the date of manufacture, when and where it was last stored, which jobs it has been used on and the safety checks carried out on it. In the initial version implemented by G&M in 2009, data from the tags was read using software running on a Motorola Symbol MC35 handheld computer. At that time hand held computers with integral RFID readers were unusual, so for this application each MC35 was equipped with a Wireless Dynamics RFID reader that fitted into the SD slot of the computer. The hand held computers were used by G&M Safety Netting’s installers as the nets are fitted or taken down on site. In-vehicle kits were used to mount the MC-35’s in installer’s vans. Recently, after more than 6 years of operation, the MC35 units have been retired and replaced with M3 Mobile Sky units which have integral RFID readers. The software system was also updated to the latest version of CheckedOK with improved web access to data and a new calendar based job logging function. So far G&M Safety Netting is using the system with over 4000 nets. Using the reader, safety nets are checked into and out of stores; on to and off site at the start and end of jobs. Job details can be entered on site and the net’s safety certificate can be checked on site too. From the data captured as a result of these checks it is possible to know the whereabouts of each safety net and how long it has been in use. Exposure to UV light is one cause of potential deterioration in the strength of netting so time on site is a critical measure of net safety. When a net is returned, the same system is used to return it to stock, place it in quarantine pending further inspection, assign it to repair, scrap or annual test or book it out to another contract directly. The system also monitors related items such as rope ties, grippers, net-claws and rigging ropes. Most recently the use of the system was extended to manage G&M’s latest, innovative, safety decking product with RFID controlling book-out / book-in of safety deck components for hire by tagging the safety deck components. Using the data collected, extensive reports are provided on net locations, net history, history of all nets at a particular site, and the schedule of nets for inspection. The data can also be exported for further analysis. CoreRFID developed and delivered the software, RFID tags, and readers and also customised the CheckedOK application to meet G&M’s requirements. CoreRFID also host and manage the central database that G&M staff access using a web based system and provided project management and training for the installation. Improved site safety by removing the risk of nets failing. Less effort in scheduled safety testing. Data collected on-site as nets are installed. Whereabouts of each net and a history of its usage. Prevents projects being delayed as a result of nets not being available. Control of boo-out / book-in of hire items such as safety decking. Potential extension to support airbags.